I have been reading a ridiculous amount of young adult fiction for work over the last month, and some of it has been great, some of it not so great. I had hit a bit of an overall rut in my stack in the last few days, and I finally got to Unraveling, a bit of a tome by Elizabeth Norris. Judging by the cover, I was...well, not very high on this one. 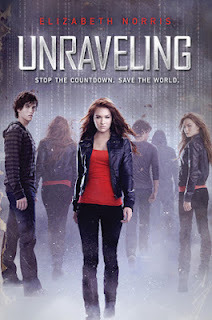 With sci-fi for teens being so polarizing, and with dystopia all the rage, I wasn't especially looking forward to the teen heroine in the unrecognizable world making good and saving whatever it is that needs to be saved.